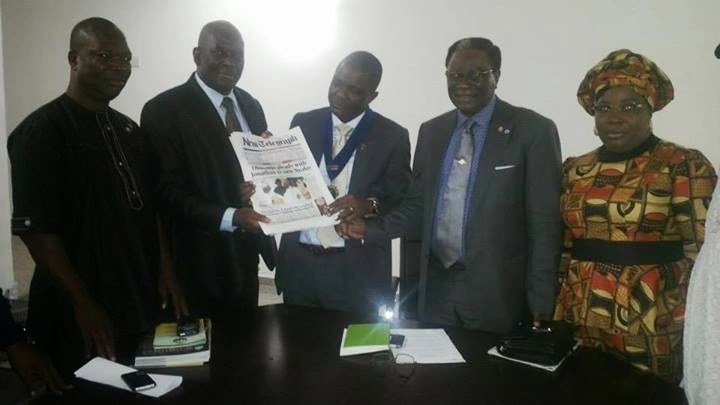 As part of the public sensitization strategies for the forth-coming World Engineering Conference on Sustainable Infrastructure (WECSI), scheduled to hold in Abuja from 2nd to 7th of November, 2014, the President of the Nigerian Society of Engineers, Engr. Ademola Isaac Olorunfemi, FNSE, paid courtesy visits to some media houses in Abuja on Wednesday, July 9, 2014. The President’s first stop was at the Abuja Bureau offices of the New Telegraph, where he was received by the Bureau tem led by the Deputy Editor/Bureau Chief, Mr. Louis Archie. Engr. Olorunfemi condoled with the management and staff of the newspaper on the death of their Managing Editor (Northern Operations), Mr. Suleiman M. Bisalla. While praying for the repose of the soul of the deceased, he urged the family members and colleagues of the late journalist to bear the loss with courage. “Our partnership with the media has spanned decades and the benefits have been immense. Upon my inauguration therefore, as the 29th President of the Society, I resolved to advance the cordiality of the relationship that has existed between us. “We know for a fact that the Press as the Fourth Estate of the realm has an institutional influence conferred by independence of opinion and judgment. We therefore implore and encourage you to continue to live up to your calling by consistently holding governments and the relevant institutions accountable for the development or lack of it in our country. At the premises of Leadership Newspapers Group, the President was received by the Managing Director, Leadership Holdings, Abraham Nda Isaiah, who happens to be a Mechanical Engineer by training. At the parley, Engr. Olorunfemi reiterated the need for a more formidable collaboration between the media and professional bodies in Nigeria. “Gentlemen of the Press, we are here to reaffirm our commitment to the partnership that we enjoy with media houses across the country, Leadership inclusive. We must continue to close flanks in our joint pursuit of a society that is free, with equal opportunities and sustainable infrastructure provision across every stratum of the country. “Gentlemen, WECSI 2014 is not just an engineering event; it is a Nigerian event. It will be the next biggest event in Nigeria after the recent World Economic Forum. “We shall be reaching out to you more often from this moment, as we will require your unflinching support in terms of comprehensive chronicling and reportage of activities leading to the big event in November. The hosts from both media houses responded in the affirmative, acceding to the need for collaborations in the collective pursuit of an egalitarian society as well as sustainable infrastructural development for the country. They also urged the leadership of the Nigerian Society of Engineers to deploy every apparatus of authority in their arsenal to ensure that they occupy their rightful position in the scheme of governance in the country. “The NSE has a huge role to play in terms of design of security infrastructure in this country. The NSE needs to let the government know that professional scientific and engineering advice is required, in addition to intelligence advice, in curbing the security challenges our country is currently faced with. “In the United States, for example, the pattern of collapse of the World Trade Centre (WTC) towers was predicted, and that was because there was science behind it. We can minimize damage and loss if we involve science and engineering in the design and development of security infrastructure in Nigeria. The NSE President was accompanied on the visits by the Deputy President, Engr. Otis Oliver Anyaeji, FNSE; Vice President, Corporate Resources/Media, Engr. Mrs. Margaret Oguntala, FNSE; and the Ag. Executive Secretary, Engr. B. Dahunsi, MNSE. Nigeria welcomes the world. I will be in Abuja. Thanks my guy.